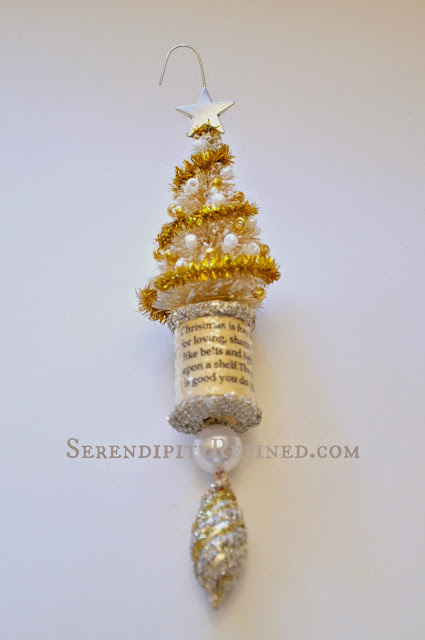 Small piece of paper with words to a Christmas song or favorite Christmas saying printed on it (or sheet music or gift wrap). Notes: You can use a larger thread spool and proportionately larger tree. If doing this, increase to two pipe cleaners for "garland". Loosely bend the pipe cleaner into a spiral. 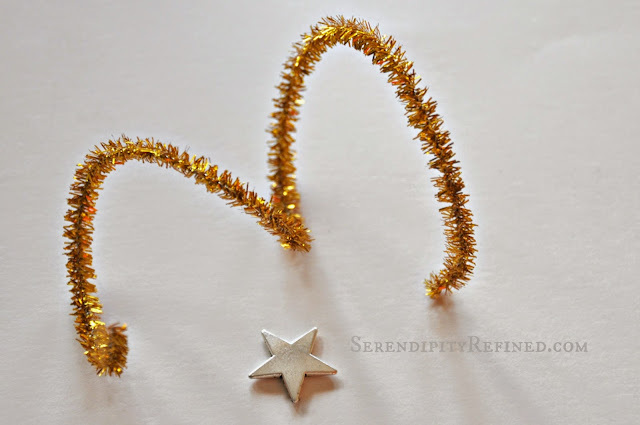 Remove the jump ring and loop from the top of the star charm using needle nose pliers and wire cutter. 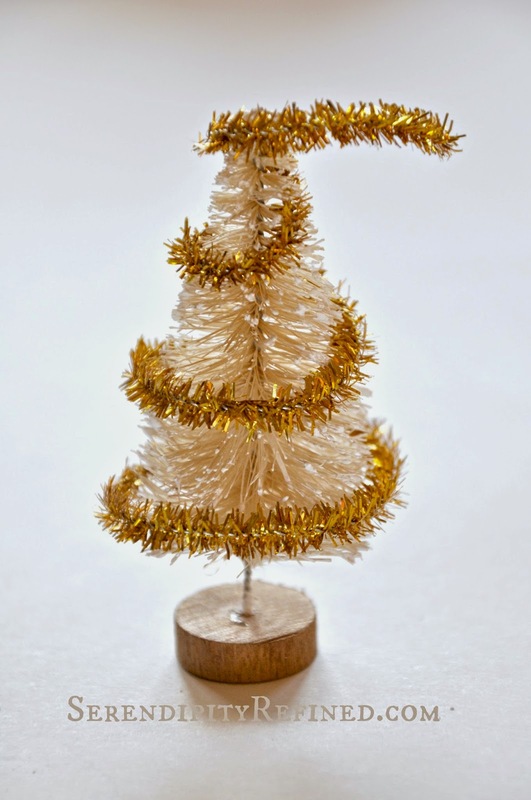 Starting at the bottom, bend the pipe cleaner around the tree on a slight diagonal working toward the top. At the top, clip off the excess pipe cleaner at a point even with the top of the tree using wire cutter. Pinch the top of the pipe cleaner to the tree using needle nose pliers. Using hot glue, attach the star to the top of the tree and glue the round bead "ornaments" to the tree. Cut the paper to fit the indented part of the spool and glue in place. 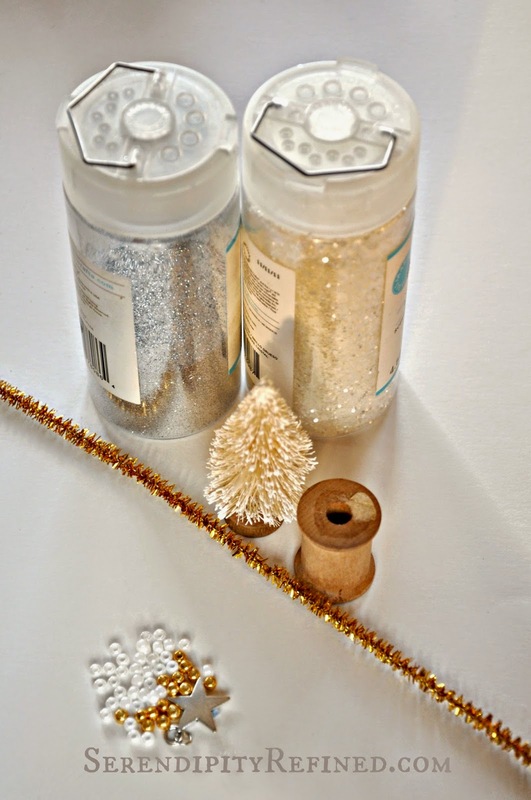 If desired, lightly dust with clear glitter. Allow to dry Brush the edges of the thread spool with glue and cover with silver glitter. 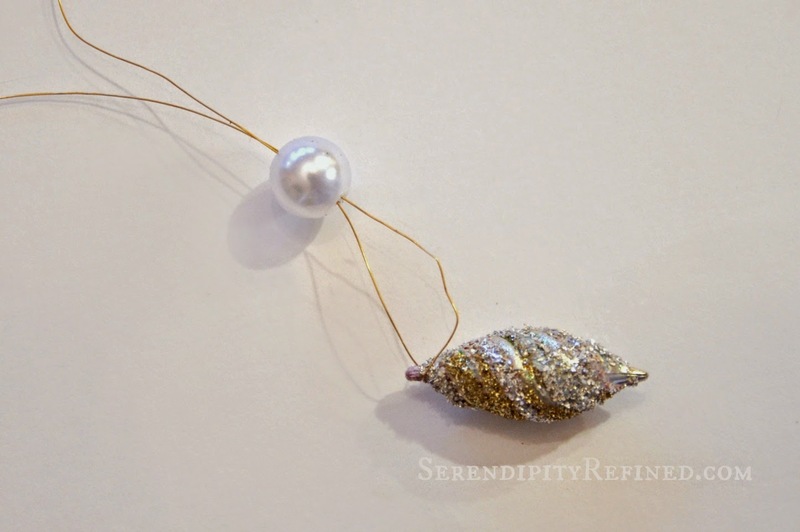 Assemble the bottom of the ornament. Thread a pearl onto the wire. 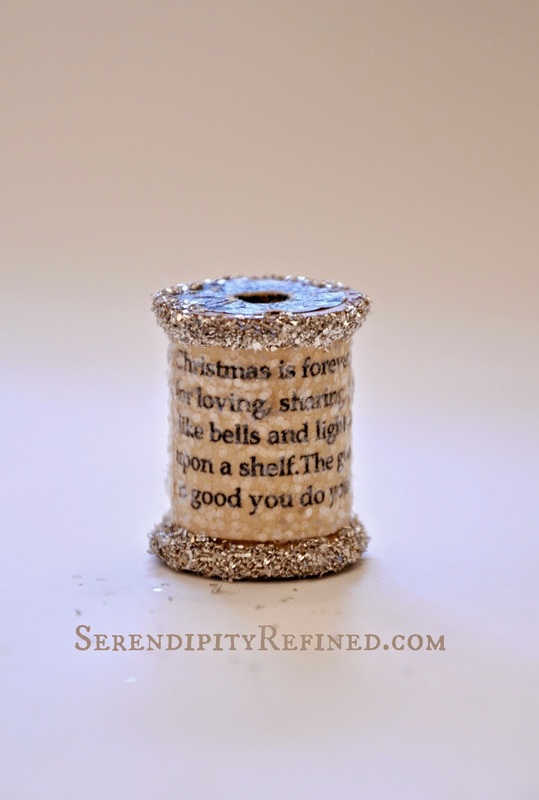 Thread a vintage shaped bead ornament onto the wire about 7 inches from one end. Pass the wire back through the pearl going in the opposite direction. thread both wires up through the bottom of the thread spool. Remove the wood base from the tree. 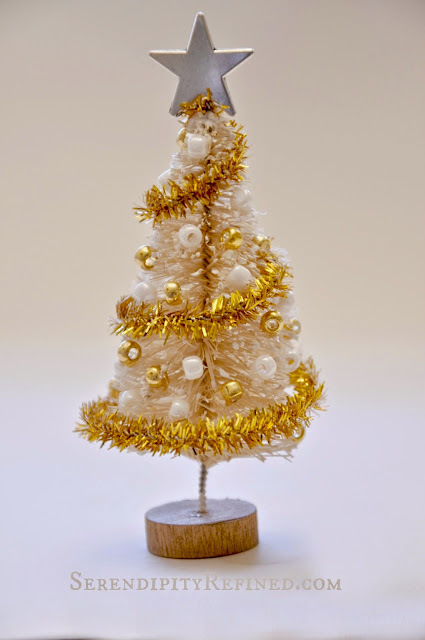 Hot glue the tree to the top of the thread spool. Wrap wires around the base of the tree and trim off excess. Glue a hook to the top of the tree behind the star. Clay Snowflake Ornament | Lovely Etc. I love to hang vintage style ornaments on my tree and to create them to give as gifts. 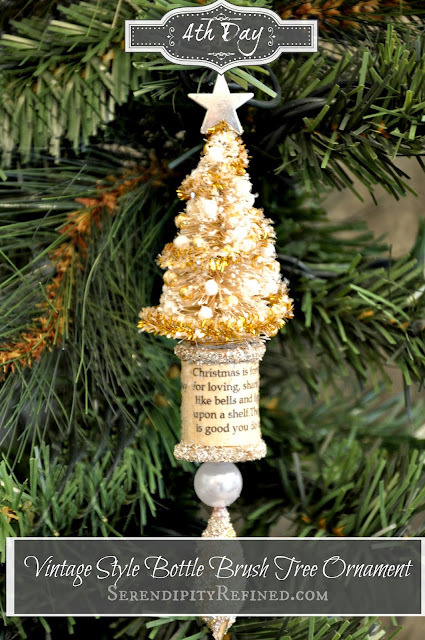 This decorated mini bottle brush tree would be lovely on it's own but it's made all the more sweet by the fact that it's sitting on an old wood thread spool. I hope that you'll make one and that you'll let me know how it turns out. I always love to see your creations!